Photo above: Gov. Larry Hogan and House Speaker Michael Busch at bill signing Tuesday. Hard feelings from the just-finished legislative session spilled over into the Board of Public Works meeting Wednesday, as Gov. Larry Hogan used his seat as chairman to call out House Speaker Michael Busch. “I’m not going to allow the petulant and unprecedented action by the Speaker, ignoring our supplemental budget, to go,” said Hogan, addressing a representative from the Maryland State Police who was testifying on police radios. Hogan’s second supplemental budget included $8 million for 100 additional troopers and the reopening of the Annapolis barracks. “We’re going to fight to get those 100 troopers on the street, because I know you need them,” said Hogan. State Treasurer Nancy Kopp, sitting next to Hogan, objected to politicizing the meeting of a board that approves state contracts and came to Busch’s defense. Kopp, a former Democratic delegate recently re-elected to a fourth term as treasurer by the legislature, defended budget choices made this session. She said lawmakers were pushing for different spending priorities than the governor. “I do know there are older citizens in their homes who hope to have community programs that won’t happen now, there are teachers in the schools that will have fewer teachers now, there are pregnant women that won’t have family health now,” said Kopp. Hogan had started the meeting with a rehash of the session he has repeated several times since Monday, but the presence of the state police major triggered a nerve. 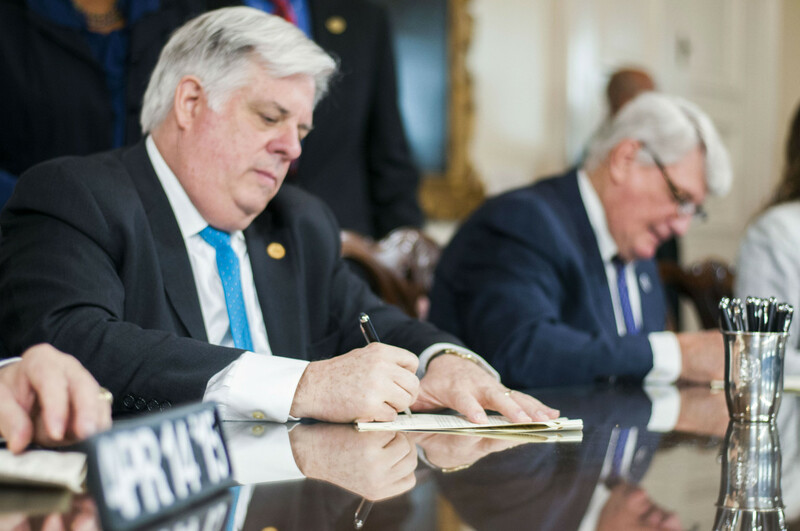 “Seeing you up here reminds me of the fact that the Speaker of the House refused to read our supplemental budget across the desk, the first time that has happened in 25 years,” said Hogan. “Read across the desk” means to formally introduce a message in the House. The governor asserted that Maryland is the only state in the country without a barracks in the capital. The item before the board was $20 million in savings found by the state police in a contract with Motorola for radios they were purchasing to allow communications with all state and local radio systems. The inability for all state and local law enforcement and first responders to talk on the same radio system has been a longstanding homeland security issue. Hogan thanked Hasenei for “proving the board right” in not granting a $20 million increase of money during the last BPW meeting. Instead Hogan insisted they find funds in existing contracts, which they did. “As you move forward, if you could please identify another 20 million in savings,” said Comptroller Peter Franchot. The room laughed, releasing some of the tension created by the earlier criticism. Franchot was quite serious. Hogan suggested creating a plan to utilize the $20 million to fund his $8 million state barracks and police force. “The scorecard right now is $20 million to the good, unless the governor takes $8 million of it,” said Franchot jokingly. Where Hogan will use the $20 million in savings hasn’t been determined, but the comptroller believes it will go to fund the $75 million the legislature cut from the Maryland State Retirement and Pension System in order to fund school aid and state employees salaries. Franchot says he is keeping his own “scorecard” of the extra funds returned to the state.